Triple quantum dot system. © S. B. Tooski et al. Quantum computers have yet to materialise. Yet, scientists are making progress in devising suitable means of making such computers faster. One such approach relies on quantum dots—a kind of artificial atom, easily controlled by applying an electric field. A new study demonstrates that changing the coupling of three coherently coupled quantum dots (TQDs) with electrical impulses can help better control them. This has implications, for example, should TQDs be used as quantum information units, which would produce faster quantum computers due to the fact that they would be operated through electrical impulses. These findings have been published in EPJ B by Sahib Babaee Tooski and colleagues affiliated with both the Institute of Molecular Physics at the Polish Academy of Sciences, in Poznan, Poland, the University of Ljubljana and the Jožef Stefan Institute in Slovenia. A small two-dimensional feed-forward Neural Network containing a single hidden layer. More efficient computational methods are urgently needed to capture condensed matter systems in simulations. Electronic structure methods, such as density-functional theory (DFT), usually provide a good compromise between accuracy and efficiency, but they demand much computational power. For this reason, they are only applicable to small systems containing a few hundred atoms at most. Conversely, many interesting phenomena involve much larger systems comprising thousands of atoms or more. Considerable effort has been invested in the development of potentials that enable simulations to run on larger system and for longer times. Typically these potentials are based on physically-motivated functional forms. Therefore, while they perform very well for the specific applications for which they have been designed, they cannot easily be transferred from one system to another. Moreover, their numerical accuracy is restricted by the intrinsic limitations of the imposed functional forms. In this EPJ B Colloquium, Handley and Behler survey several novel types of potentials emerged in recent years, which are not based on physical considerations. 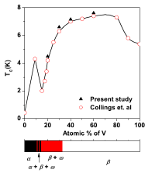 The variation of the superconducting transition temperature (Tc) as a function of vanadium concentration along with the binary phase information for the quenched Ti-V alloys. © Matin et al. Graph of the normalised empirically found distribution of the American Dow Jones Industrial Average index, DJIA (red squares), and European Euro Stoxx 50 (blue circles) index data with prices recorded every minute data along with the Standard Normal curve for comparison. © Green et al. Due to their previously discovered fractal nature, financial data patterns are self-similar when scaling up. New research shows that the most extreme events in financial data dynamics—reflected in very large price moves—are incompatible with multi-fractal scaling. These findings have been published in EPJ B by physicist Elena Green from the National University of Ireland, Maynooth, Ireland and colleagues. Understanding the multi-fractal structure of financially sound markets could, ultimately, help in identifying structural signs of impending extreme events. A free particle strongly coupled to a heat bath. © Adamietz et al. In theory, the laws of physics are absolute. However, when it comes to the laws of thermodynamics—the science that studies how heat and temperature relate to energy—there are times where they no longer seem to apply. In a paper recently published in EPJ B, Robert Adamietz from the University of Augsburg, Germany, and colleagues have demonstrated that a theoretical model of the environment’s influence on a particle does not violate the third law of thermodynamics, despite appearances to the contrary. These findings are relevant for systems at the micro or nanometer scale that are difficult to decouple from the heat or the quantum effects exerted by their environment. Snapshot of the final configuration of a nc-Si sample. © Melis et al. Physicists are now designing novel materials with physical properties tailored to meet specific energy consumption needs. Before these so-called materials-by-design can be applied, it is essential to understand their characteristics, such as heat flow. Now, a team of Italian physicists has developed a predictive theoretical model for heat flux in these materials, using atom-scale calculations. These findings, published in EPJ B by Claudio Melis and colleagues from the University of Cagliary, Italy, could have implications for optimising the thermal budget of nanoelectronic devices—which means they could help dissipate the total amount of thermal energy generated by electron currents—or in the production of energy through thermoelectric effects in novel nanomaterials. Average voltage output of a DC SQUID under varying conditions. © Berggren et al. Theoretical physicists are currently exploring the dynamics of a very unusual kind of device called a SQUID. This Superconducting Quantum Interference Device is a highly sensitive magnetometer used to measure extremely subtle magnetic fields. It is made of two thin regions of insulating material that separate two superconductors – referred to as Josephson junctions – placed in parallel into a ring of superconducting material. In a study published in EPJ B, US scientists have focused on finding an analytical approximation to the theoretical equations that govern the dynamics of an array of SQUIDs. This work was performed by Susan Berggren from the US Navy research lab, SPAWAR Systems Center Pacific, in San Diego, CA, USA and Antonio Palacios San Diego State University. Its applications are mainly in the military sector, including SQUID array-based low-noise amplifiers and antennas. One of graphene’s most sought after properties is its high conductivity. Argentinian and Brazilian physicists have now successfully calculated the conditions of the transport, or conductance mechanisms, in graphene nanoribbons. The results, recently published in a paper in EPJ B, yield a clearer theoretical understanding of conductivity in graphene samples of finite size, which have applications in externally controlled electronic devices. Three free standing 3C-SiC substrates with size 10x10 mm (Fig. 16). A new EPJ B Colloquium reviews the latest advances in silicon carbide (SiC) for optoelectronics. The wide bandgap of SiC makes it a great semiconductor material to make devices for in high power, high frequency and high temperature applications. During the past decade, SiC has also become a promising materials for light-emitting diodes (LED), since it was found that co-doping it with nitrogen and boron produces a high donor-acceptor pair emission efficiency. Fluorescent SiC based white LED light source is an innovative concept for optoelectronic devices. 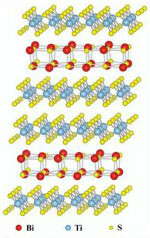 Superlattice structure of (BiS)1.2(TiS2)2 misfit layer sulfide. (Fig. 15). The growing need for alternative “green” energy sources has prompted renewed interest in thermoelectric materials. These materials can directly convert heat to electricity or, conversely, use electrical current to cool. The thermoelectric performance of a material can be estimated by the so-called figure of merit, zT = σα2T/λ (α is the Seebeck coefficient, σα2 is the power factor, σ and λ are the electrical and thermal conductivity, respectively), the value of which depends only on the material. In a new EPJ B review, authors Gonçalves and Godart discuss the state of the art in this field, with special emphasis on the strategies to reduce the lattice part of the thermal conductivity and maximize the power factor in thermoelectric materials.